Choosing the best vacuum for stairs can be a challenge because there are so many makes and models available. Where do you even start? Ideally you need a model that is lightweight, handheld, has good reach and powerful suction. Cordless models can also be beneficial for staircases with a large number of steps as they aren’t restricted by a power cord. 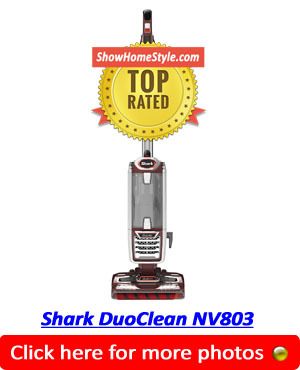 After comprehensive research of over 30 different makes and models, we have chosen the Shark DuoClean Powered Lift-Away NV803 as the best vacuum cleaner for stairs 2018. It’s a great all round vacuum cleaner for all areas of your home, but is especially useful on stairs, both carpeted and hard floor, because you can detach the light weight canister and hose to give you an easy to carry and operate handheld vacuum cleaner. This Powered Lift-Away detachment is great for cleaning stairs, upholstery, automobiles, beds, curtains, ceiling fans, and anything else that you need a handheld type vacuum for. It’s also really good at picking up pet hair and dander from all surfaces using it’s patented DuoClean Technology. 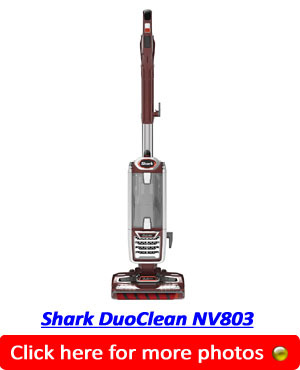 Shark offers this lightweight, compact Lift-Away vacuum with DuoClean Technology. It has two brush rolls. One is a bristle brush that cleans carpets deep down. The second brush is a softer one that pulls up large particles and debris and leaves hard surfaces polished. The second brush can pick up stuck-on dirt on hard floors. The vacuum also features an anti-allergen complete seal HEPA-filter system. It gets up almost 100 percent of dust and allergens. The vacuum is easy to operate with fingertip controls that let you switch from hard floor to carpeting. It also has powerful, bright LED lights on the nozzle so you can see more dirt and get at it better. 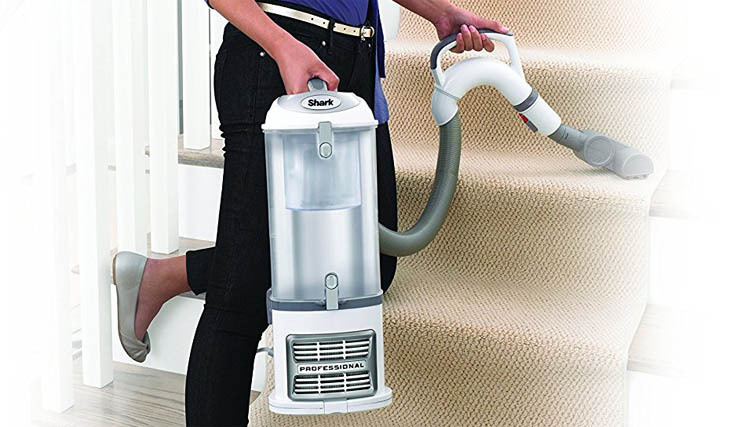 The tool is extendable and with the lift-off feature, you can easily vacuum up and down stairs or steps as needed. What most users love is that there is a button that pops the head of the bottom open to get at the rollers. Inside is a tool to cut away hair from the rollers. 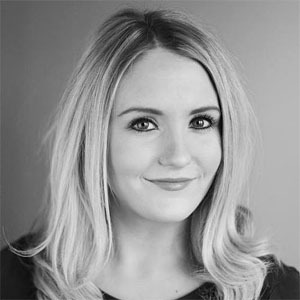 The vacuum can pick up so much fur and hair that the rollers do get covered but with the easy open technology and the hair-cutting tool, it is a snap to see when they need cleaning and get back to cleaning after removing the hair. It also cleans tile, hardwood, and laminate floors well. Some users wish that the suction and cleaning was better on carpets, and also that the head was wider. This vacuum has a 10-inch wide cleaning path which makes it great for tight spots. The model number confuses some buyers but be assured the NV803 is the same as the 801. The 801 is sold only in Kohl’s stores, the 803 for other retailers like Amazon and, if you purchase it from Shark, it is model 800W. 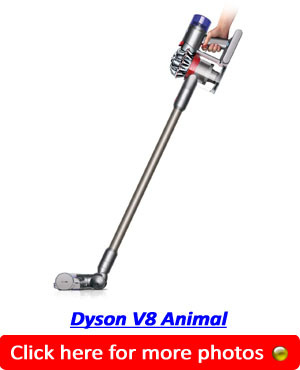 The Dyson V8 sports an attractive metallic design and potent suction power for cleaning up after pets big and small. In addition to a potent motor and strong suction power, the Dyson V8 is also equipped with direct-drive cleaning heads that provide 150% more deep cleaning power than its predecessor. The Dyson V8 can also be converted from a stick vacuum to a handheld device that allows you to reach every corner high and low. This feature combined with the impressive lightweight, a mere 5 lbs, allows this model to be used effortlessly. There is an optional opening with softer bristles that works best for dusting and an extension handle for getting all those hard to reach areas. The potent Lithium Ion battery has more power now, and can last for a full 40 minutes of cleaning, which is more than adequate for small and medium sized homes. In addition to meticulously collection all vestiges of pet hair, the top notch HEPA filtrations systems will also collect the finest pet dander and all allergens and contaminants larger than .03 microns. A convenient docking station and 7 minutes of Hi-Power operations are two other nice features of the Dyson V8. Those who have used this impressive stick vacuum had similar comments on its performance. It is a very effective tool for keeping homes clean and especially those with multiple pets. To give you an idea of the caliber of cleaning power, one reviewer uses this Dyson V8 to clean up after two full grown huskies and will attest to its efficacy. Other reviews commented on the fact that 40 minutes is not sufficient time for large cleaning projects and that the lack of a full set of appliances make it hard to clean upholstery and furniture. Those users of a specific height, may also find the exhaust blow in the direction of their face, which could be annoying at best. 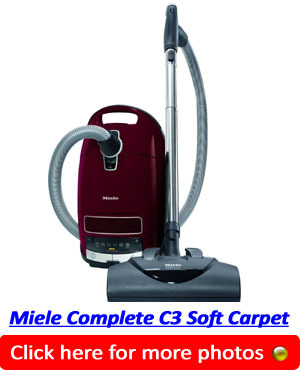 The Miele branced Complete C3 Soft Carpet Cleaner is a great vacuum for homes and small offices. It features adjustable, suction-control footswitch pedals on the canister, and comes with a parquet twister floor brush. The vacuum is ideal for those with allergies, because it has a HEPA Filter, and the dust-canister seals well. It’s a small, neat vacuum cleaner with built-in storage, and three 360-degree Swivel Wheels to make it as easy as possibl to control and move around. This is a higher-end model, and it works well on all floor types, including both hard floors and soft carpets. It has multiple add-ons to serve different surfaces, including hard floors, low pile carpets, and medim-pile carpets. The 1,200 watt vortex motor offers powerful suction, and the air-clean sealed system prevents dust escaping. If you are looking for something that can cope with most surfaces and that can handle pet hair, dust and allergens. This cleaner was designed with the assistance of carpet makers, and this means that it will clean your carpets properly and will prolong their life too – protecting the best carpets that you have in your home. This carpet has had great reviews, because it offers a simple parking system for storage, and the floor tile is versatile too. The HEPA filter comes with its own built in indicator, which users appreciate beacuse it makes it clear to them when the filter needs changing. The estimated lifespan is about one year. One thing that people dislike is that the brushroll does not automatically switch off when the powerhead is parked. However, you can shut it off manually using a switch which is conveniently located on the hose. There are lots of options for cleaning and supporting the filters. 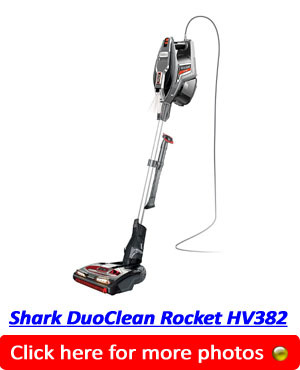 This vacuum from Shark has the same reliable DuoClean technology so many of its other popular models have. There are two brushes, one that is bristled to clean carpets thoroughly and one that is soft to pull up larger bits of dirt or hair while polishing hard floors for a clean you can see. This is super-lightweight and can convert into a hand-vac that weighs just under five pounds. Great for cleaning above your floors. You can use it for furniture or drapes. As with other DuoCleans, the brush roll is easy to remove and it even comes with a special tool that is hidden in the bottom. Use it to clear and cut away any hair that gets wrapped on the rollers. It also has a multi-tool designed for pet owners to get up any embedded pet hair wherever needed. It also has LED lights on the nozzle and the hand vac so it is easy to see hidden dirt wherever you clean. Some people that have purchased the vacuum find that it does not come with the crevice or multi-tool, but it does. The pet tool is motorized versus the suction one that is on other Shark models. It works better. The vacuum never kicks dirt back out like some models do. Even if you are using it on a throw rug or a hard surface, dirt in the canister. The canister is rather small so you might need to stop several times to empty it if you are cleaning larger rooms. This is a little annoying but the fact is that this lightweight vacuum gets a lot of stuff up just on one pass. If you switch to a lower power level you can get by on fewer trips to dump out the cannister but you will need to go over the surfaces a few more times. 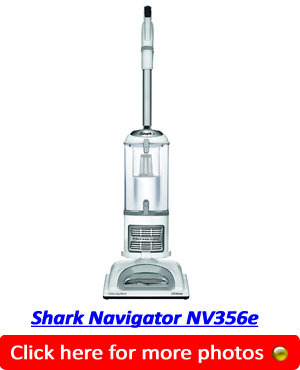 The Shark Navigator Lift-Away Professional NV356E is a sleek, high powered vacuum for the home. It comes with numerous features that make it a lot easier to keep carpets, as well as hardwood floors, looking good and staying clean. For starters, despite being a professional grade vacuum, it’s also extremely lightweight, weighing less than fourteen pounds. This means no more dragging a heavy vacuum around or struggling to lift and carry it up or down a flight of stairs. No more back pain caused by vacuum cleaners! The Lift-Away Professional NV356E version also comes with Lif-Away technology. If there are hard to reach places, a simple press of a button allows the canister to be lifted away. No more time wasted or physical struggles to get those tough areas clean. Its Hard Floor Hero technology allows it to get up stuck-on debris or trash, making it easy to keep hardwood or tile floors clean, too. This means no getting down on hands and knees or bending over to pick up bits of trash. There is also a HEPA filter with Anti-Allergen Complete Seal Technology. This filter locks in 99.9% of all allergens, dust and fibers. If there is someone in the home with allergies, the Shark Navigator Lift-Away Professional NV356E will help to make things a lot easier. The cord is thirty feet in length. This will help cut down on having to plug the vacuum into different outlets. The dust cup capacity is a whopping 2.2 quarts. You’ll be saving time by spending less time emptying the vacuum which gives you more time to do the things you really want to do. The Lift-Away Professional NV356E also comes with gentle cleaning for both the bare floor and deep carpet cleaning. Customers have been thrilled with the powerful suction of this vacuum, stating that it does a very thorough job of cleaning both bare floors as well as carpets. Its versatility and light weight are also a big hit. For the quality of the vacuum the price is also a positive factor, with many people comparing it favorably to the more expensive, but similar, Dyson models. The most notable issue with this Lift-Away model is that it’s not the most sturdy of vacuums. The clips are flimsy and it is mostly plastic. But so is the Dyson, as many customers note. 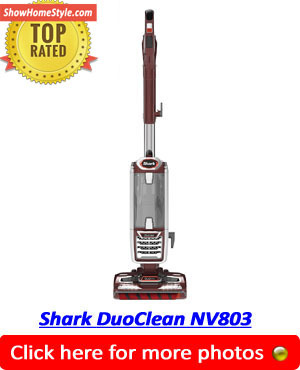 If you’re looking for a high quality vacuum that will give your carpets a thorough cleaning, while also getting a great price, you should really consider the Shark Navigator Lift-Away Professional NV356E.